Using this gadget, you can embed a Facebook page on a Wild Apricot site page. 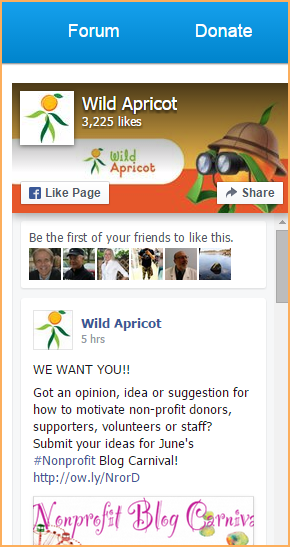 Your visitors can like and share the page without leaving your Wild Apricot site. To be displayed, the Facebook page must be verified and open to the public, with no country or age restriction. You cannot use this gadget to link to a Facebook group or Facebook profile. The Facebook page gadget uses Facebook's Page Plugin. The URL of the Facebook page you want to embed. Do not enter the URL of a Facebook profile or Facebook group. For an explanation of the differences between a page and a profile, click here. Check this option to show the faces of friends who like the page. Check to show posts from the page's timeline. The width of the gadget. The minimum width is 280 pixels and the maximum is 500 pixels. The height of the gadget. The minimum height is 130 pixels.